This morning while getting ready, I enjoyed a lovely choir of bird songs gently floating through the window from the back yard. By the time I got to work, it was raining. I love when it rains and love it even more when it thunderstorms. Drip-drip-drip.... The soft sound of trickling rain drops is so calming, serene, thought-provoking and romantic. Truth be told, when it rains time just seems to stop -and I could just spend the whole day lost in thought. Better still, I'd rather be lost in thought embraced by your Sweet Romance. When I call, text or email you, it means I'm thinking of you. When I don't call, text or email you, it means I'm waiting for you to think of me. I created the Sweet Romance jewelry wardrobe board because I was thinking of you and smiling. 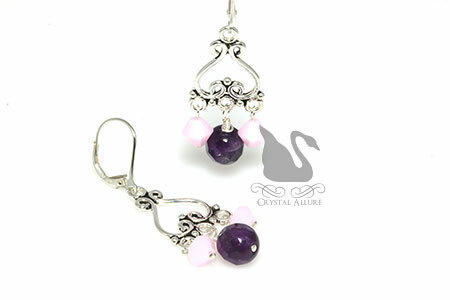 The centerpiece of this romantic purple and pink set features lovely faceted amethyst gemstones paired with sweetly pink rose alabaster Swarovski Crystals dangling from upside-down heart-shaped sterling silver Bali chandelier beaded earrings. Finished with sterling silver leverback ear wires. Mother's Day is just a few short weeks away and if you're anything like me, you always have a hard time finding that just perfect gift to give Mom. I've always had a "thing" for matching or complimentary Mother and Daughter Bracelets. I believe they symbolize just how special the mother-daughter bond really is. Which is why I created two new designs inspired by the Tiffany Beads Collection of sophisticated sterling silver beads. I added a bit of color and style with a full beaded strand of Swarovski Pearls. Just perfect! Inspired by the contemporary style of Tiffany's sterling silver bracelets, this two-strand mothers bracelet features one full strand of sterling silver beads and one strand of burgundy Swarovski Pearls mixed with sterling silver beads. Finished with a sterling silver heart toggle clasp, "MOM" heart charm and our signature jewelry tag. Handmade beaded bracelet measures 7-1/2". Inspired by the contemporary style of Tiffany's sterling silver bracelets, this two-strand daughters bracelet features one full strand of sterling silver beads and one strand of tahitian Swarovski Pearls mixed with sterling silver beads. Finished with a sterling silver heart toggle clasp, "DAUGHTER" heart charm and our signature jewelry tag. Handmade beaded bracelet measures 7-3/4". Do you have a favorite Swarovski Pearl color that you would rather have in this design? No, problem! Customize these beaded bracelets by selecting a different pearl color. Contact us for available options. Autism is a spectrum disorder of neural development characterized by impaired social interaction, communication and by restricted and repetitive behavior. The Centers for Disease Control and Prevention released a phone survey analysis that showed a 72 percent increase, in 2012 from 2007, in the likelihood of a school-aged American child to be diagnosed with autism, Aspberger syndrome or a related developmental disorder. Although the current report reflects 1 in 50 children receiving a diagnosis, it was emphasized most of the increase was because of previously undiagnosed cases. With the increase prevalence towards an Autism spectrum diagnosis, I wanted to contribute to raising awareness of Autism through our beautiful crystal Awareness Jewelry Collection. NEW to Crystal Allure Beaded Jewelry is a collection of Autism Awareness Jewelry offering handcrafted beaded awareness bracelets and awareness earrings in support of raising Autism Awareness. 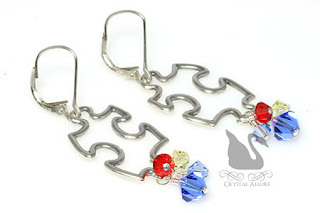 Our Autism Awareness Jewelry will always feature the representative colors of red, yellow, dark blue and light blue in Crystals by Swarovski. The Crystal Puzzle Piece Autism Awareness Bracelet (B081) (shown above) also includes sterling silver beads, Bali, a beautiful double crystal charm dangle, sterling silver puzzle piece charm, awareness ribbon and our signature jewelry tag. The bracelet measures 7-1/2". The beautiful Crystal Puzzle Piece Autism Awareness Earrings (E290) feature the representative Autism Awareness colors in Swarovski Crystals delicately dangling from sterling silver puzzle piece charms on sterling leverback ear wires, measuring 1-1/4" from the bottom of the leverback. It's the middle of April and the pre-prom planning has already begun with excitement about who you will go to prom with, dress shopping, flowers and sparkling accessories, of course! For various reasons, I never went to prom (junior or senior). There are moments where I've wished I had gone and had that experience. I mean, come on, prom is a young adults' first big social event of their life -a rite of passage, if you will. Over the years, prom, has certainly changed -a lot (especially if you ask your parents about their prom days!). These days, prom is the event of the year. It's filled with excitement, hope, (for some) sweet love, glitz, glamour, fond memories and good friends. So, I decided to pair my love of formal dresses with a little prom sparkle from Crystal Allure Beaded Jewelry. I chose to dress for prom this year in Pantones' color of the year for 2013 -emerald. What better color to wear to prom, right?! 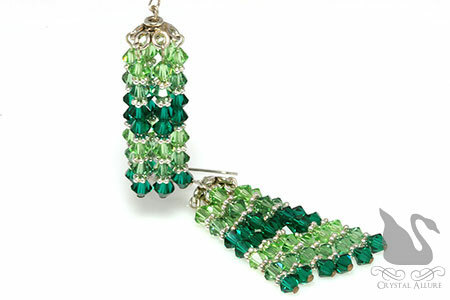 Knowing full well, there was only one pair left in these stunning Emerald Swarovski Crystal Chandelier Earrings (E072), I couldn't help but go out in search of the perfect dress that would compliment them. Yes, I pair clothes to my accessories (not the other way around)! Ignore what you've heard -it really is all about the accessories! I came across one perfect gown, from Prom Girl. Why is this dress perfect? 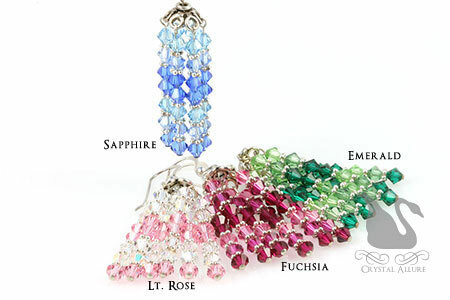 Because you could wear these earrings with either the green or the purple gown! I love it! But, let's say you like to stand out and be a little different -a little more daring. No worries! Just as easily as these sparklers pair with the beautiful gowns above, they would be equally stunning with this eye-catching short emerald dress (not for the faint of heart!). Personally, I'd choose the full length gown. But, which dress would you choose? What is your prom color and gown of choice this year? May is National Cystic Fibrosis Awareness Month. I am always happy to raise awareness of cystic fibrosis since it does run in my family. In fact, my brother was born with cystic fibrosis. Regardless of whether a disease affects 2,000 or 10,000 people, when you are personally touched by a particular disease, you want to fight harder to bring attention to it in hopes a cure will be found. For some, not only are they affected by cystic fibrosis, they are also faced with related diabetes issues. Cystic Fibrosis Related Diabetes (CFRD) is extremely common in people with CF. This unique type of diabetes remains the inspiration for our selection of designer beaded CFRD awareness bracelets. The latest Cystic Fibrosis Diabetes Awareness Bracelet (B028-D2), shown above, was designed with sparkling purple Swarovski Austrian Crystals, gray Swarovski Pearls accented with sterling silver beads. Finished with a sterling silver awareness ribbon charm and our signature jewelry tag. Purple is the nationally recognized awareness support color for cystic fibrosis, which is often referred to as 'sixty five roses' by young children. Gray is the awareness support color for diabetes. Check out our other beautiful handmade beaded bracelets raising awareness of cystic fibrosis. The first shown below is the Sterling Purple Cystic Fibrosis Awareness Bracelet (B166); the second is the Lovely Lampwork Ribbon Cystic Fibrosis Awareness Bracelet (B151). Shown above is a sophisticated strand of sparkling purple amethyst Swarovski Crystals and bright sterling silver Bali accented with white Swarovski Pearls make up this stunning handmade beaded bracelet designed to raise awareness of Cystic Fibrosis. Finished with a sterling silver awareness ribbon charm and our signature jewelry tag. Measures 7-1/2". So what are you doing this May to raise awareness of cystic fibrosis? 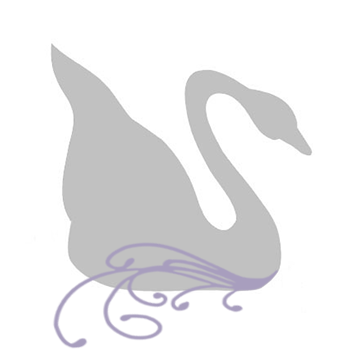 I'd love to hear what your awareness activities are, please feel free to leave a comment.